Last weekend marked the official start of the holiday shopping season in the U.S., so for the next month, consumers will be enticed with daily deals on the latest fads, such as one-cup coffee makers, tablets, flat screens and cashmere sweaters. According to the latest survey from the Consumer Electronic Association, about 60 percent of adults plan to shop in stores or online during the holiday weekend, with the average person indicating they'll fork over $218 for gifts and merchandise from Thanksgiving through Cyber Monday. This is a sharp increase from 2011, where shoppers said they'd spend $159. 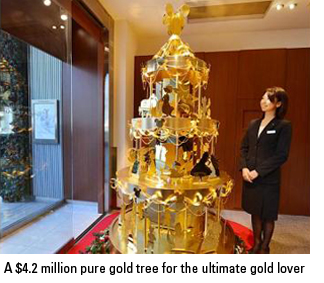 For the ultimate gold lover on your shopping list, one amazing purchase you can nab is a Christmas tree complete with Disney characters and gold leaf ribbons made of 88 pounds of pure gold from a jewelry store in Tokyo, according to Reuters. The ornamental tree will set you back $4.2 million, but there's also a smaller version available for $243,000. But that's not the only thing that has grabbed my attention this holiday season. Here are 5 other amazing consumer trends that are happening around the world. The New York strip boasting high-end shopping, including Tiffany's, Louis Vuitton, Hugo Boss and Fendi, has been knocked from its No. 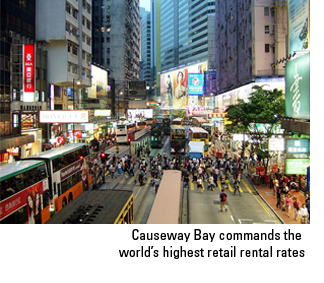 1 position as the retail area with the top rental rates around the world. Hong Kong's Causeway Bay area commands more per square foot than any other place on the globe, according to a report from Cushman & Wakefield, a real estate firm. Tourists and mainland China residents have been flocking to Causeway Bay to shop at places including Burberry, Coach and Gucci that are among its Times Square's 230 shops located on 16 floors. Shoppers can also head to Causeway Bay's Fashion Walk, which features local fashion designers and trends catering to a young and fashionable crowd. 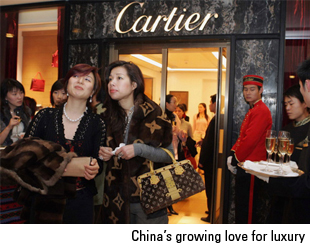 With sales of luxury goods including designer handbags, clothes, jewelry, fine wine and spirits growing 18 percent every year in China, the country is on track to surpass Japan, Italy and France as the biggest luxury market in the world. While the U.S. is still projected to remain the top country in luxury-goods sales, consumers in Brazil, Russia, India and China (BRIC) have been closing the gap. Luxury sales in BRIC countries made up only 4 percent of the total in 2007, but at the end of 2012, it's expected to be 11 percent. The city of Macau, which is the only Chinese territory where casino gambling is legal, is the world's largest gambling town. In 2011, casinos took in $33.5 billion, five times more than the establishments in Las Vegas. With a population of 500,000, the city's average citizen makes more than the average person in Europe. 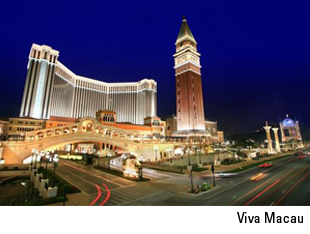 Over the last decade, Macau has grown by 19 percent a year-twice as fast as mainland China. It continues to see a whole lot of money that's ready to burn, to quote Elvis Presley, and American casino companies have been clamoring for a piece of the action. Steve Wynn opened a casino in Macau in 2006 and now makes most of his profits there, says The New Yorker. Sheldon Adelson built Sands Macau in 2004, and later opened a $2.4 billion Venetian Macau which houses the largest casino floor in the world. In September 2012, Adelson unveiled plans for The Parisian, which will have 3,000 rooms and a 50 percent scale replica of the Eiffel Tower. A 7-inch Android tablet developed in India may present stiff competition to the more expensive counterparts made by Apple and Google, potentially making all tablets a little less expensive in the future. Datawind's Aakash 2, with 512MB of RAM and 800 x 480 pixel resolution, was developed as an affordable way to get technology, especially e-books and the Internet, into the hands of students in India. 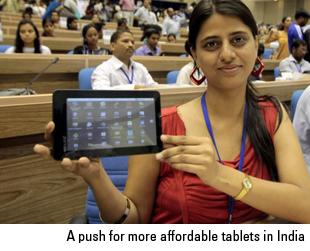 Deployed by the government in post-secondary schools, the Indian Ministry of Human Resource Development subsidizes some of the cost, making the tablet available to college students for $35. To help students access the Internet on the tablets, the government has been working to connect 600 universities and 1,200 colleges with broadband and Wi-Fi. 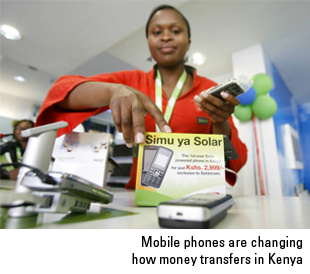 A lack of financial infrastructure is making phone-based payment systems attractive in some emerging markets around the world. Due to the growing number of cell phones in the Philippines along with overseas Filipinos who send money back to their families, the mobile money payment business offered by Smart Communications and Globe Telecom has been consistently growing in recent years. U.S. firms are making sure they aren't left out of this growing business: In 2011, San Francisco-based Visa purchased South African firm Fundamo, which provides mobile phone-based payment services in the underbanked emerging markets in Africa, Asia and Latin America. Just as the love of gold is intertwined throughout the East and the West these days, globalization is making the world more connected than ever. Soon, "keeping up with the Joneses" may no longer refer to only the neighbors who live on our block. In emerging markets, supportive government policies, rising wealth and access to innovative technology may be an influential source for future Black Friday purchases in the U.S.